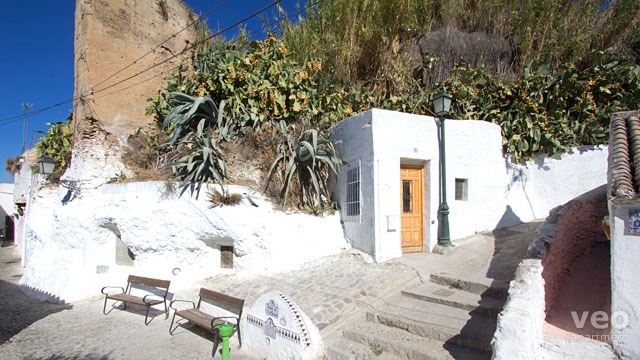 Traditional Casa Cueva -or "Cave House"- located in the Sacromonte district. These are traditional dwellings excavated from the soft rock of the hillside unique to the province of Granada. It is located moments away from the Mirador of Mario Maya, which offers one of the best views in the city of the Alhambra, and adjoins the 14th century Nazrid defensive wall. 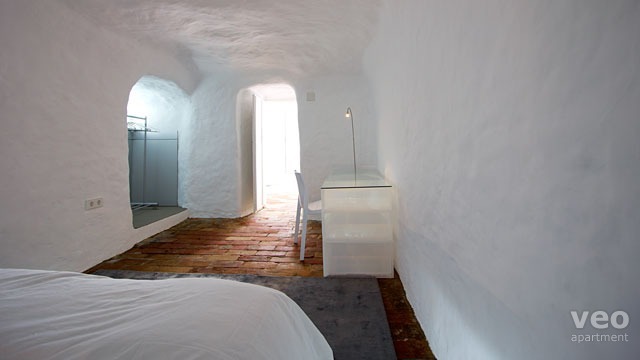 Like all Casas Cueva, "Cueva II" maintains the same ambient temperature of 18-22°C throughout the year. 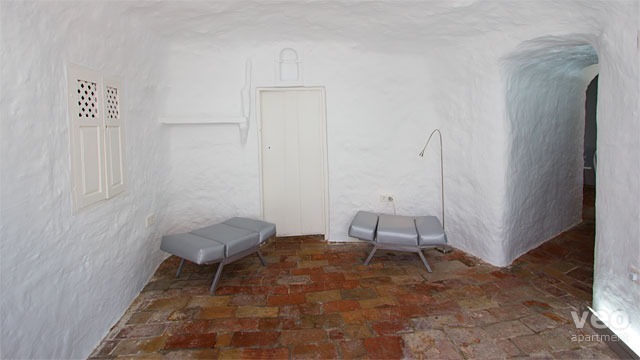 Sensitively restored in 2012, the house is decorated simply, using neutral colours and respectful of the fabric of the cave. Terracotta flooring gives the only touch of colour, and the furnishings and lighting, by contrast, are completely modern. 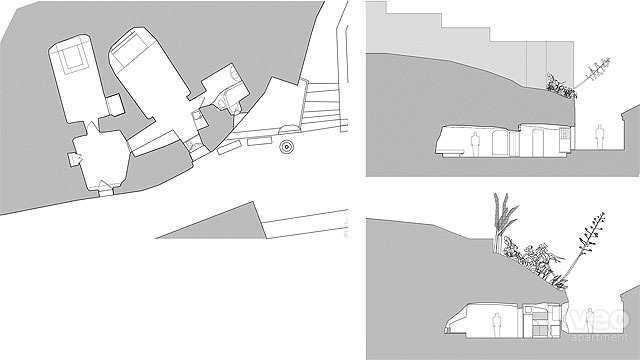 The entrance is through a doorway cut in to the rock, and gives on to a hall. To the right is the kitchen, well-equipped for self-catering. Through a large archway is the living area, which is furnished with a bench, upholstered chairs, and a dining table and four chairs. There is also a flat-screen TV. 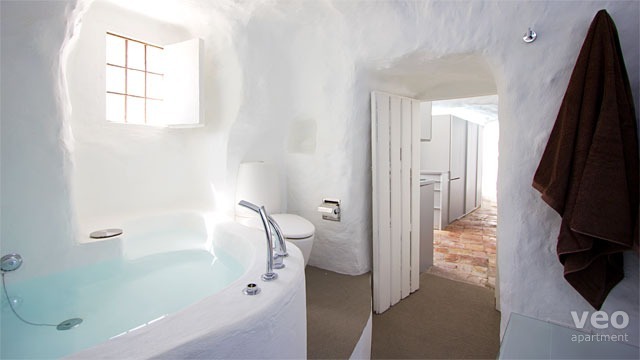 The bathroom is beyond the kitchen, and features a large bath which integrates perfectly with the walls of the cave. Contemporary lighting, a modern-style sink and a mirrored wall give a touch of luxury. The bedroom is just off the entrance hall and features a double-bed, a desk and a large niche carved into the rock for the storage of clothes. 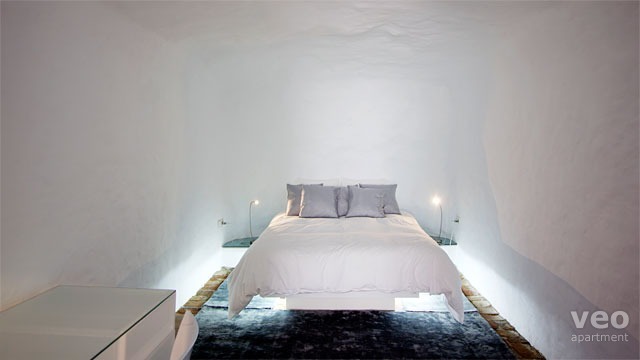 Floor-level lighting under the bed gives an atmospheric feel to the room. Heating: With 2 radiators - one in the bedroom and other in the living room -, and electric heating in the bathroom. Sacromonte is a neighbourhood of the Albaicín district built on a steep hillside and is famous for its caves and resident gypsies. It is only 1.5 km from Plaza Nueva, yet has a totally different feel. Due to the nature of the geography, it is not suitable for those with mobility problems. Sacromonte is the second hill on the opposite side of the valley formed by the Darro river from the Alhambra hill. The first, directly facing the Alhambra, is the Albaicín neighbourhood, and adjacent to the right, Sacromonte. It is only 1.5 km from Plaza Nueva in the city centre, but has a totally different feel. The nature of the geography makes it unsuitable for people with mobility problems, but it's highly recommended for travellers who are looking for an authentic Granada experience. Sacromonte derives its name from the nearby Sacromonte Abbey, which was founded in 1600 on the hill of Valparaiso outside the old city. 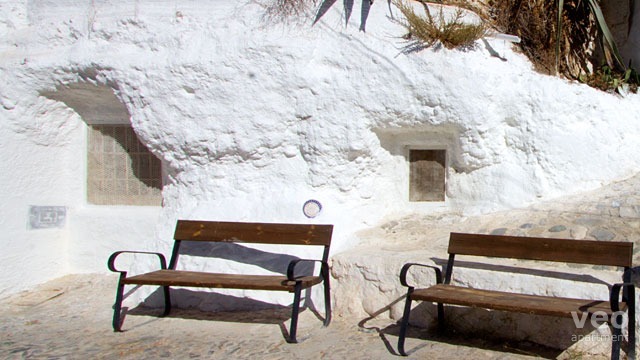 By the 19th century, the area had become home to a substantial Gitano community, who built their houses in caves excavated from the soft rock of the hillside. 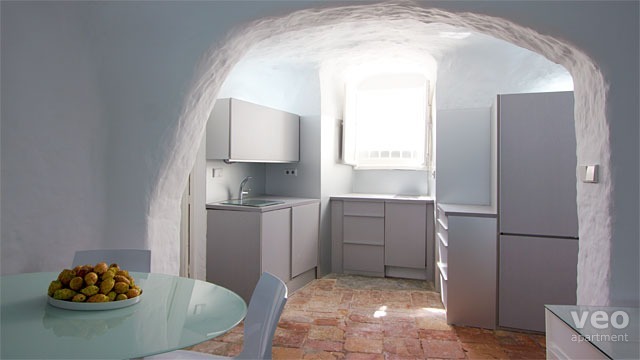 Nowadays, some owners are converting this former modest housing into luxurious and cutting edge designer cave apartments. 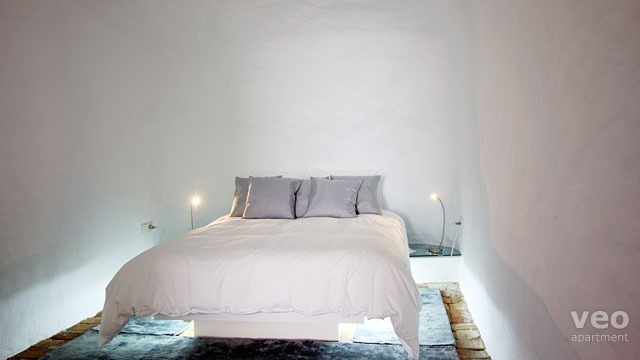 Natural chalk walls in combination with some contrasting furniture and lighting give a minimalistic and at the same time dramatic ambience (see "Sacromonte Cueva 1" video). The caves which have been prepared for tourist rentals are next to more traditional ones, where the gypsy community organizes Flamenco shows in the traditional Zambra style, with the spectators sitting in a circle around the perfomers (see "Tarantos" video). 14:00 - 22:00h. Supplement for late check-in from 22:00 to 24:00h: 25 EUR (to be paid in cash, on arrival). Early check-in is possible but subject to availability - please enquire. Baby cot: free of charge (ask for availability). Location: The apartment is located on a pedestrian street with no vehicle access. If being dropped off by car or taxi, the street nearest to the Cave open to traffic is a 2-3 minute walk away. There is a bus stop 4-5 minutes walk away for lines C1 and C2, which connect the Albaicín and Sacromonte with the centre. The Albaicín neighbourhood can be reached in 5 minutes by foot and Plaza Nueva in 15-20 minutes. Driving: Access by car is difficult. Except residents, it is prohibited to enter by car from 11:00 to 14:00hrs and from 20:00 to 00:00hrs. Parking: There is a free parking area at 10 minutes walk from the apartment. situation : sportif mais nous, on aime ça ! Seule remarque: le canapé lit un peu dur. un peu frais mais bon....Le robinet de la cuisine n'est pas adapté. Magnífico apartamento, con encanto, muy bien equipado y limpio. Muy recomendable excepto para quien tenga dificultades en las calles empinadas. Ventajas: muy bonito, limpio y acogedor y con unas vistas espectaculares de la ciudad por toda la zona. Inconvenientes: si vas andando tienes que subir bastante para llegar (aunque hay autobuses muy frecuentes que paran cerca de la casa) y por las noches hace frío, aunque con el edredón y la estufita se está muy bien. Lo único malo: al ser cueva se nota mucho la humedad. Cet appartement/maison fait partie de la réussite de notre séjour à Grenade. Pour ceux qui veulent vivre une expérience inoubliable, c'est un endroit que nous recommanderons sans hésiter. Notre famille composée de deux enfants (10 et 13 ans) n'ont pas eu de mal à grimper Sacremonte, le quartier historique où se trouve cet appartement. L'endroit est idyllique car Alhambra est juste de l'autre côté de la vallée. Hormis ce point positif, je signale que vivre trois jours dans cette maison est quelque chose à raconter à ses proches. De plus, la maison a été entièrement rénovée avec goût mêlant tradition et design, le moderne et l'ancien. Le linge de maison est extrêmement propre, la literie est très confortable, la propriétaire très attentive au confort de ses locataires : elle nous a guidés par téléphone pour retrouver la personne chargée de nous accueillir (qui nous a en plus accompagnés jusqu'à un parking non payant mais sûr et nous a beaucoup aidés pour d'autres choses). Bref, un vrai régal ! Merci. The apartment is in a lovely location with breathtaking views of Granada. Only a short (downhill) walk to the city center. Would not recommend to elderly or disabled individuals because the (uphill) walk to the apartment is fairly steep. The internet access was spotty; however, this inconvenience was far outweighed by the beautiful neighborhood and overall experience of Granada. 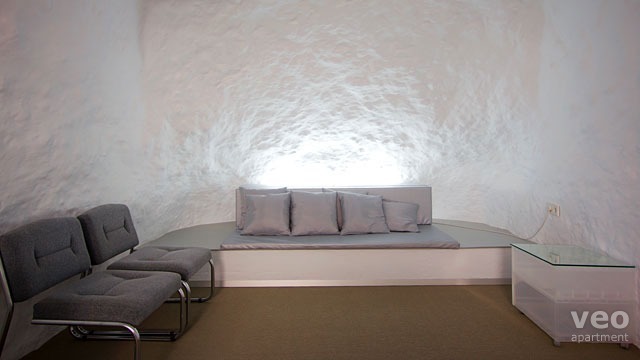 The cave is surprisingly spacious, well laid out and comfortable. Only stayed for 2 nights, if it had been summer would happily have stayed longer but in March it did get a little chilly at night. Quite a novel place to stay and somewhere really different. The facilities (kitchen, bed, tv etc) were an excellent standard. Bathroom lovely. Only advise, take slippers the stone floors are a bit chilly! "Aun mas bonito de lo que parece"
Me parecio aun mas bonito que en las fotos,con todo lo necesario para pasar unos días de relax sin casi ni salir del apartamento,vistas preciosas,el trato fantástico,todo perfecto. "An unusual and charming treat of a place"
We loved this place. Having looked at several other options we simply couldn't resist the idea of staying in a cave. 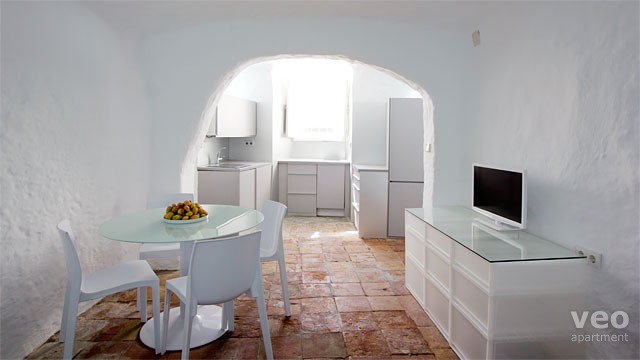 It has quite a few interesting features in the lumpy walls - niches here and there, wonky old doors and shutters, all whitewashed so it feels like being inside an iced fruit cake. 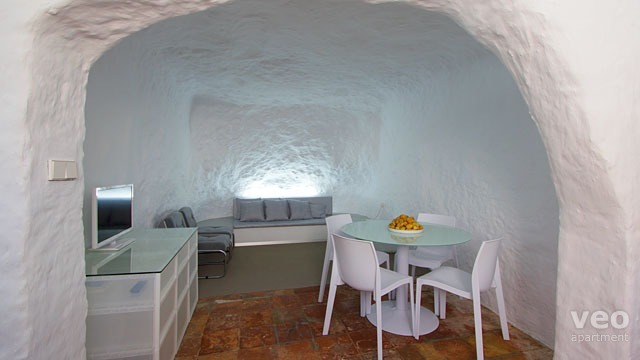 Its cave-ness means it stays cool in summer and warm in winter - a haven at siesta time! The street is very quiet apart. from local kids and frequent bicycle tours, but due to the acoustics you can hear every word people speak outside. If you leave the shutters open at night be ready for intrigued people pressing against the mesh and peering in, it must look very alluring because it happens a lot. The Sacromonte area is great, stunning views of the Alhambra and charming little lanes to get lost in. We walked to the Alhambra ticket office in just 20 minutes, but be ready for a steep climb down to the river and then another up the Cuesta del Rey Chico. "Un lieu magique, un raffinement exquis"
Ces grottes sont très agréables à vivre en été. The apartment was really fun, I loved how it was furnished. Geraldo was so accomodating and really nice. It was super clean and had incredible views. When I had not written phone numbers down Ava was above and beyond to get numbers for me. All our needs were addressed and our visit was perfect. .
We stayed here for 4 nights in July and I wish it had been longer! From the outside (yes, it really is a cave) you have no idea of the beautiful house that awaits you inside. There has been a lot of thought put into the design, and the furnishings and linens are of high quality. The cave is well located in Sacromonte so away from the crowds of the centre, with views of the Alhambra and close to local restaurants and shops; we even found a parking space close by! 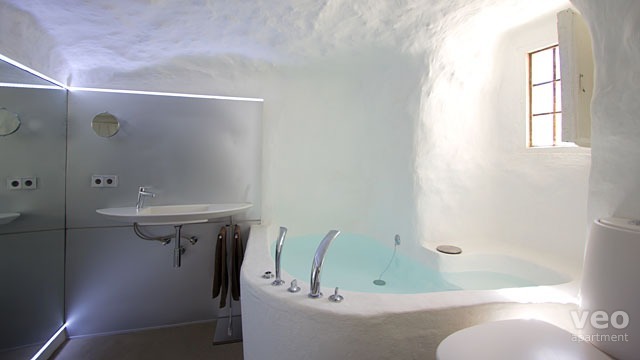 The temperature inside the cave is most welcome in the Summer heat, and the bath is to die for! I would thoroughly recommend staying here if you want a different experience within walking distance of central Granada. El apartamento estaba genial; sacromonte cae lejos, pero es muy autentico; fuimos con un bebe, y, aunque no es lo más recomendable por situación, estuvimos realmente agusto.